A combination of federal, state and county officials, along with a mix of local fire fighters and volunteer search and rescue organizations, encamped at the Randles Sand and Gravel plant in Frederickson last Saturday for a round of disaster training. 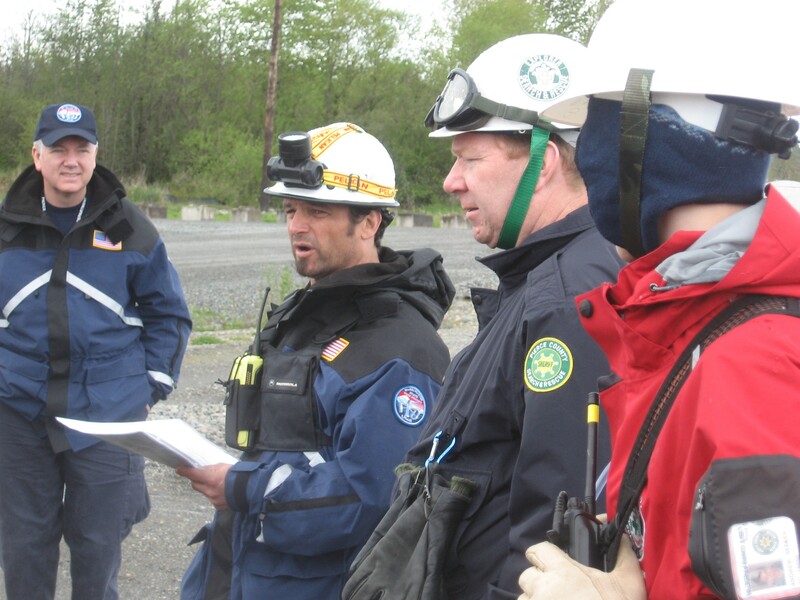 The exercise was conducted by the state’s premier rescue unit, known by its FEMA designation, Washington State Task Force One (WA-TF1), which is one of twenty-eight units in FEMA’s nationwide Urban Search and Rescue Task Force (USRTF). Led by program manager, Mike McCaffee, WA-TF1 is comprised of 210 members drawn from local fire and police departments, search and rescue outfits, and governmental agencies, such as Pierce County’s Department of Emergency Management (DEM). The latter has several staff members serving in WA TF1, such as McCaffee and his equipment chief, Fran Sharp. Mike McCaffee, far left, observes one of his training groups preparing to launch a "wide-area search." The county’s DEM also played a major role in the training exercise, and supplied much of the equipment used, including vehicles, communication gear, and specialized probes and cameras to locate and pull people from structures destroyed by an earthquake. In addition, WA-TF1 has specialized staff members, such as trauma physicians, structural engineers and dog handlers, who deploy with this unit in actual emergencies. The WA-TF1, as with all of the FEMA’s urban search and rescue units, specialize in “collapsed building rescue,” according to McCaffee. McCaffee described an enormously complex and comprehensive response his unit is able to deliver to a stricken community. “Our engineers first assess a structure, and then advise us on how to proceed,” McCaffee declared, saying that his team has the ability to shore-up slabs of concrete or to tunnel through rubble to find survivors or extricate victims. “It’s almost like a mining operation,” he said. Once inside a collapsed structure, medical treatments can begin almost immediately. In addition, the physicians are also trained to perform amputations in case a survivor has no other way of being freed from the rubble. Mike McCaffee, center, stands with a member of WA-TF1 and several dog handlers and volunteers during a training exercise in Frederickson last Saturday. 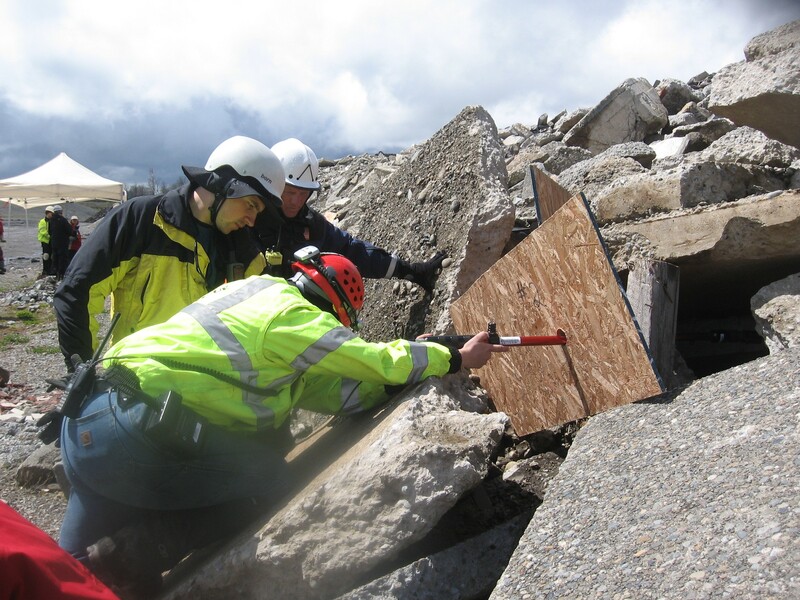 Although WA-TF1 has deployed in several recent hurricane disasters, such as Katrina, its primary mission is to respond to major domestic earthquakes, and not surprisingly eight of the twenty-eight FEMA task force units are located in California. Many units also responded to the Oklahoma Citybombing, and the tornados in Alabama last month. In addition, WA-TF1 and many of the FEMA teams went to New York for 9-11. FEMA search and rescue units also respond to international events. “Some of the other FEMA units deployed to Haiti, and we were on stand-by to go to Japan,” said McCaffee. As a result, McCaffee and his team members have paid close attention to the events in Japan. “Japan is a near-perfect template for what could happen here with the Cascadian Subduction Zone,” said McCaffee, referring to the major earthquake zone that runs 600 miles from Cape Mendocino in California north to Vancouver Island, and traverses close to the Washington – Oregon coastline. “When the Cascadian Subduction Zone goes, it could be big, 9-plus,” McCaffee said. 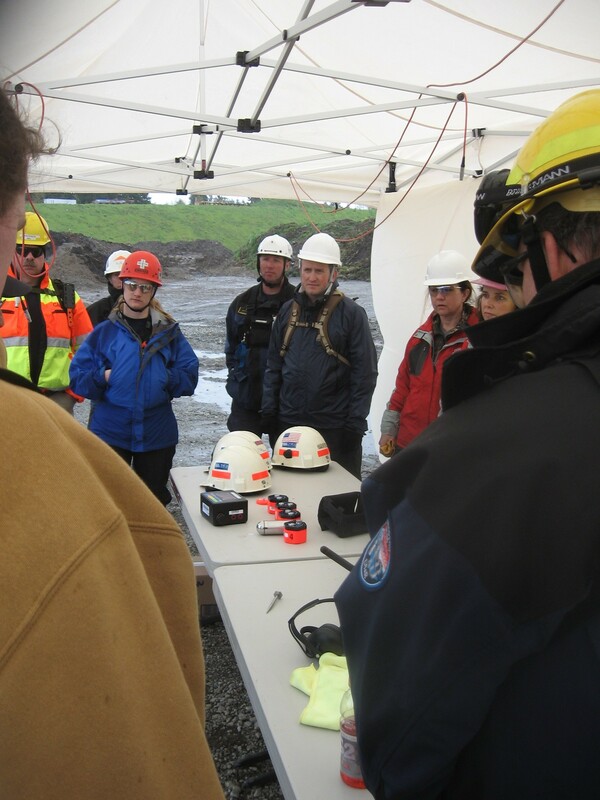 Members of the WA-TF1 and the Explorers Search and Rescue, get a briefing on sound-locating equipment. When WA-TF1 does deploy, it initially sends out a 70-member team, which gets divvied further into two, 35-person day and night shifts. In addition, the 70-member team is equipped to be self-sufficient for three days, carrying all of its tentage and heat, food and water, and rescue equipment. 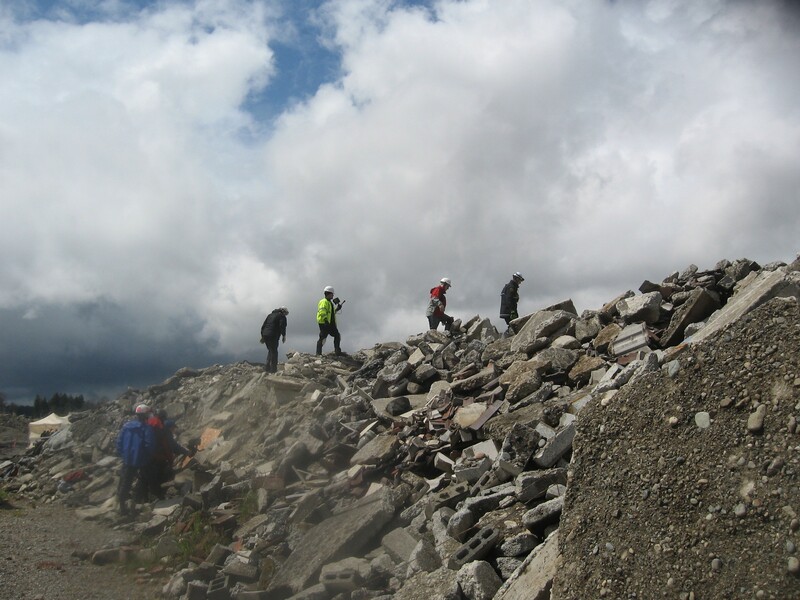 For the training exercise, WA-TF1 invited several local volunteers groups to join, such as the Key Peninsula Mounted Search and Rescue, the Pierce County Explorer Search and Rescue, and The Mountain Search and Rescue. 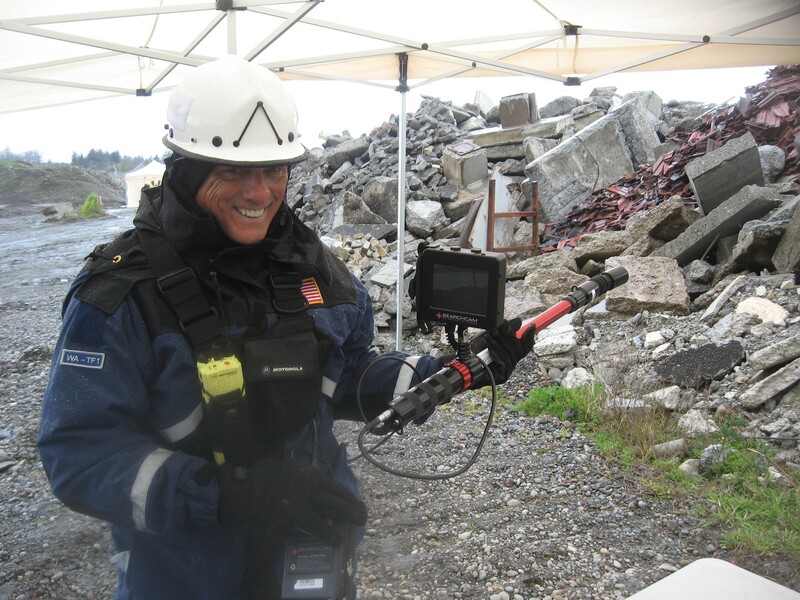 As WA-FT1 practiced their leadership skills, the volunteers learned how to detect sounds of life within a rubble pile by utilizing a “thumper” device, and how to probe with video cameras on a telescoping pole. Local search and rescue volunteers practicing with a telescoping camera to explore a rubble pile. In addition, the groups practiced “wide-area searches” utilizing GPS devices and their communication gear to assess and document a twenty-acre expanse in the Randles pit that had dozens of little red flags sticking up to simulate dead and injured victims. When a searcher found a “body” they would radio the coordinates to a medical team, who then comes in to dispense care. However, their overarching mission is search and rescue, and once the search is over and the rescue completed the team moves on. “We like to pass-off longer-term medical care to other established, indigenous groups, such hospitals or the Red Cross,” said McCaffee. As for an actual search and rescue operation, the outline is simple. Bob Barden, a WA-TF1 member from the Mercer Island Fire Department, who was leading volunteers in the camera exercise, described the basics to the Mountain News. Bob Barden displays one of the telescoping cameras. Barden said the training is essential, as so many variables and dangers can make the difference between life and death. In addition, the hazards are extreme when climbing in and around concrete, rebar and furniture shards. 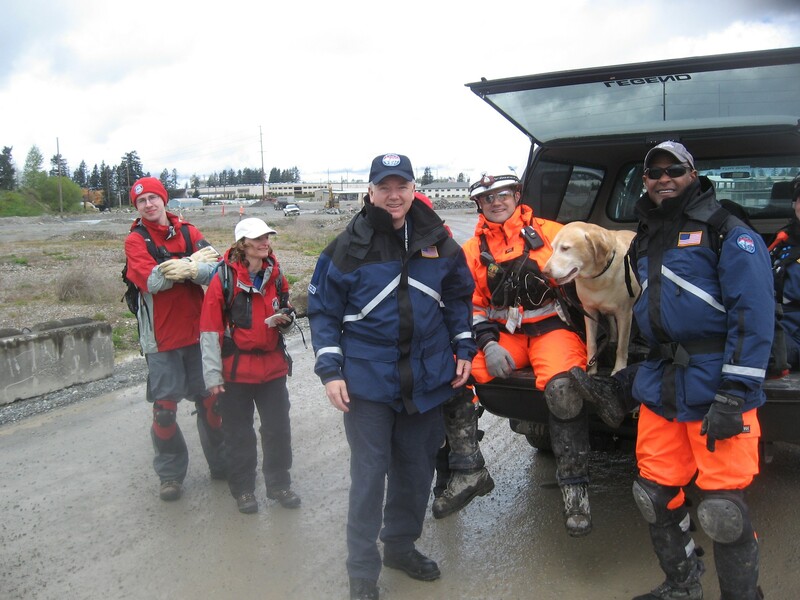 As a result, all search and rescue members wear helmets, steel-toed boots and rugged, warm clothing. But even in a chilling rain that made the gravel yard a mud pit, the volunteers and WA-TF1 members said the day was a great success. “Yeah, it was great,” said Brad Stutz, a volunteer from the Graham area. “We learned lots and had a good time,” said members of the Peninsula Mounted, as they sloshed their way to the command buses and hot coffee. As a seasoned pro with over twenty years in disaster management, McCaffee simply gazed over the scene and smiled. He knew his team was ready. For more information, click on Amy’s ad in the column to the right; please scroll up. Thanks! This entry was posted in Cops and courts, Events, Frederickson, Nature, Self Reliance. Bookmark the permalink.